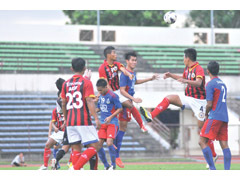 BORNEO RIVALRY … Sabah and Sarawak players clash during a goalmouth melee. KOTA KINABALU: It is end of the road for the Sabahawks Juniors in the President’s Cup challenge 2013. Despite nicking a narrow 1-0 win over Sarawak at the Likas Stadium yesterday, it was not enough to put the Sabahawks Juniors into the quarter-finals. They saw their hope turn into ashes, as Kedah won their battle against Penang at the Darul Aman Stadium in Alor Setar, also played yesterday. The feat saw them finish ninth in the 18-team standings with 53 points, two behind eight placed Kedah. A defeat for Kedah could have seen the State Under-21 team march into the last eight, but unfortunately Kedah were in brilliant form as they thrashed the visiting Penang 5-0. “We did our part to win the game against Sarawak, and there is nothing more we can do about it,” said team manager Datuk Juil Nuatim when met after the match. “It has been a challenging season, and it’s just too bad that we cannot make it into the quarter-finals. We were so close to making it through, but this is football, and we are paying the price for not doing well enough to earn a place in the next round. “Anyway, I still believe that we have a decent side, and despite not making the cut, I think our level is not too far away from the rest of the top teams. Personally, I think our scoring has been a big letdown throughout the season, if not, we could have made it,” he added. And Juil could be correct, as the Sabahawks Juniors were denied of nicking a bigger win due to poor finishing. Instead, they settled for a narrow win, courtesy of Anwari Md Tajuddin in the 15th minute. The flanker struck the solitary goal of the match from inside the box. After the opener, Sabahawks Juniors had numerous chances of extending their lead, but again, their strikers seemed to have left their scoring boots at home. When the second half resumed, it was the same scenario, and despite dictating play and creating numerous scoring opportunities, they just could not finish them. Hafizan Jahar was among the culprits, as in the 53rd minute, despite having an empty goalmouth, he failed to connect a brilliant cross from Didie Arizal Ibrahim. Hafizan saw his weak attempt from just about six yards out cleared by a Sarawak defender. In the 63rd minute, Md Ikmal Akid saw his close range grounder hit the goalpost and rebound out of play. Two minutes later, Didie’s curling shot from about 25 metres out went above the crossbar, before Sarawak had their own close call when Mohd Hisyam’s 35 metre freekick was tipped for a corner by Rendy Robson. For the record, Perak, Johor, Pahang, Kelantan, Terengganu, Selangor, Kedah and Negeri Sembilan are the top eight teams that made it into the last eight.